At Bob Mims Heating & Air Conditioning, we’re always looking toward the future of heating and AC technology. Like any field, HVAC continues to advance with new developments, refinements, and innovations. Even comparing air conditioners and furnaces from only a decade ago shows how far the new equipment has advanced. We’ll take the gas furnace as an example. After all, it’s the most common type of heating system in the country, and many Staten Island, NY homes have gas furnaces working through winter to provide them with warmth. Your Gas Furnace Still Needs Electricity! We’d like to clear up one of the major misunderstandings about furnaces that we still hear: a gas furnace will be able to supply a home with heat in case of a power outage. On the surface, this makes sense. 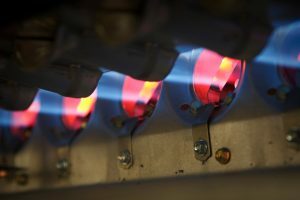 A gas furnace uses the burning of natural gas to create the heat that then goes through the ventilation system. It’s like an old-fashioned stove this way: no need for electric power, just plain old heat from consuming another power source. However, this is not true. If your gas furnace doesn’t have electrical power, it won’t run. Posted in Heating | Comments Off on Your Gas Furnace Still Needs Electricity! What’s That Sound from My Furnace Mean? It would be nice if the technology of furnaces included an A.I. (artificial intelligence) program that could immediately diagnose any malfunction when it first starts and then notify homeowners of what is wrong. But we don’t yet have these sorts of furnaces. So to know when there’s a problem, we have to watch for certain warning signs. One of the most common is odd sounds. Posted in Heating | Comments Off on What’s That Sound from My Furnace Mean?